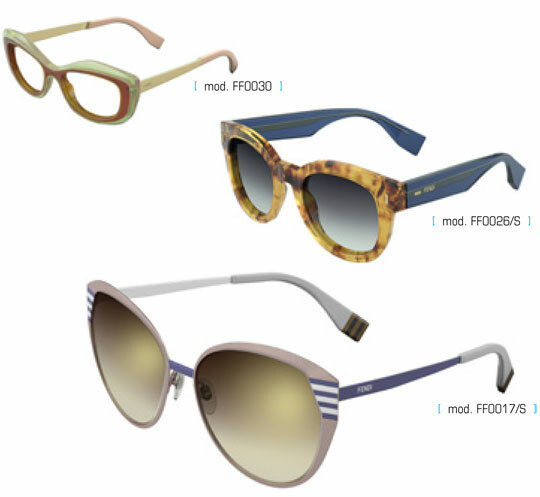 Last summer Sàfilo Group signed a licensing agreement to produce and distribute Fendi sunglasses and optical frames starting in 2014. The company now presents its first Spring/Summer collection, dedicated to the contemporary, unequivocally feminine woman. The new collection includes sophisticated models featuring unique shapes and iconic detailing, such as the Fendi monogram, the legendary striped “Pequin” motif and the celebrated 2Jours decoration. Skillful manufacturing techniques enhance the new glasses’ premium quality materials, such as Optyl and exclusive acetate, celebrating the House’s perfect savoir-faire and timeless elegance. The colour palette consists of refined shades and edgy colour contrasts highlighted by an alluring interplay of materials, jewel-like details and shaded or mirrored lenses. Eye-catching and stunning, the two Color-Block models are a perfect combination of contrasting dimensions and colours, smooth lines and multifaceted profiles, enlivened by transparent hues and refined shades of havana. These exclusive hand-made acetate glasses feature a large silhouette and slim metal temples emphasized by the flat hinge on the initial part of the temples and contrasting colours on the acetate temple tips. The large, butterfly-shaped flat metal FF 0017 sunglass model flaunts an ultra-lightweight, essential feel and smooth silhouette. The iconic striped “Pequin” motif framing the lenses – a signature detail adorning the House’s legendary accessories – creates an alluring combination of gloss varnish and metallic effects, highlighting the eye. The classic black/tobacco striped “Pequin” motif decorating the temple tips adds a distinctive, discreet touch. This model’s perfect proportions are emphasized by an elegant palette. The acetate FF 0026/S sunglass model looks to the past with its vintage-inspired silhouette and retro flair, highlighted by contrasting colours on the front and temples. Small rivets bearing the iconic striped “Pequin” motif become the brand’s distinctive signature detail. An edgy colour palette enhances the contrast between the front’s natural shades and the temples’ vibrant, pop-inspired hues, perfectly reflecting Fendi’s Spring/Summer 2014 accessory collection.